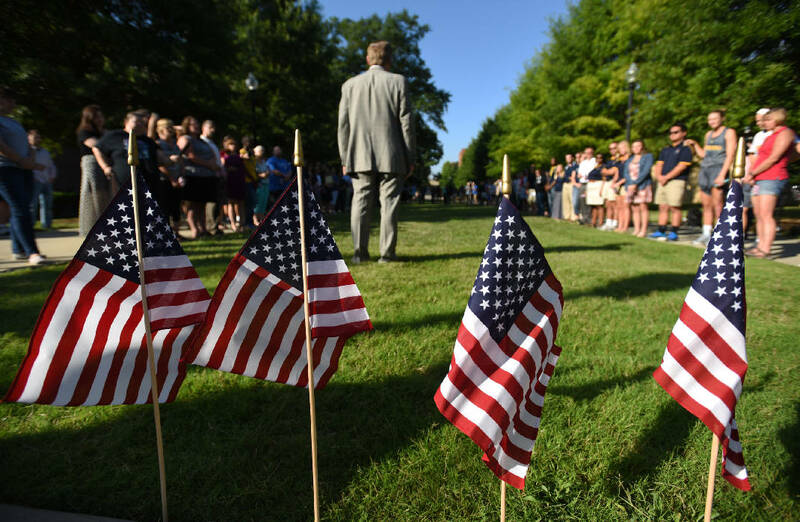 Dr. Steven Angle, Chancellor, speaks to a gathering on the University of Tennessee at Chattanooga campus Friday, July 17, 2015, to honor four Marines who were killed yesterday at the U.S. Naval and Marine Reserve Center on Amnicola Highway. A crowd of students, community members and veterans gathered this morning at the flag pole in front of the University of Tennessee at Chattanooga to remember the four marines killed Thursday in what has been described as a possible "domestic terrorism attack." "It kind of brings you back to 9-11 again to know that people were senselessly gunned down in a place where we should be able to feel the safest, said Robert Barbar, a veteran who served in three tours overseas. After a moment of silence, the crowd turned to honor the four flags that were placed in the lawn to honor the four marines killed. Thomas J. Sullivan, a marine from Massachusetts, and Skip Wells, a marine from Atlanta, have been identified by other media outlets. None of the marines have been officially identified. Students at UTC had mixed feelings about how to react to the news that the gunman, identified as Hixson resident Mohammad Youssef Abdulazeez, graduated from the university in 2012. "It did make it strike closer to home knowing we walked the same halls,"said Ashley Combs, a senior at UTC and a Navy veteran. Jeremy Bryson, a UTC senior and Army veteran, said he doesn't care that the shooter went to his school. "It doesn't matter," Bryson said. "I know he didn't learn it here. I know he didn't learn it in this community so it doesn't matter where he's from." "Four marines died let's worry about that," he said. "There's four mothers that don't have their sons." This morning, Senator Corker and Governor Haslam visited victims of the attacks at the hospital, a Corker spokeswoman said. They visited the injured police officer, identified as David Pedigo, who is in stable condition, and a Marine recruiter who the spokeswman said "is fighting for their life. Corker and Haslam "expressed their deepest sympathy and offered support in the days and months ahead," Corker's office said. Chattanooga Police Chief told a Times Free Press reporter there have been no credible retaliatory threats against any community in the wake of Thursday's attacks. Still, Fletcher said, if anyone feels threatened they should contact the police department or call 911.